April of 2013 will mark North Carolina's Inaugural Beer Month. Thirty days dedicated to celebrating our state's craft beer culture. The Triangle's a pretty big player in the brewery scene, if you guys didn't know. There are 20 breweries located in the Triangle, 8 of them in Raleigh. The newest addition to the roster is Trophy Brewing. Trophy Brewing Company is new to the Raleigh beer scene. The three-barrel nano brewery is located in downtown Raleigh at 827 W. Morgan St. featuring a full bar and growlers to go. The guys behind Busy Bee Cafe, Chris Powers and David “Woody” Lockwood, opened Trophy Brewing Company to fulfill their dream of having their own brewery. 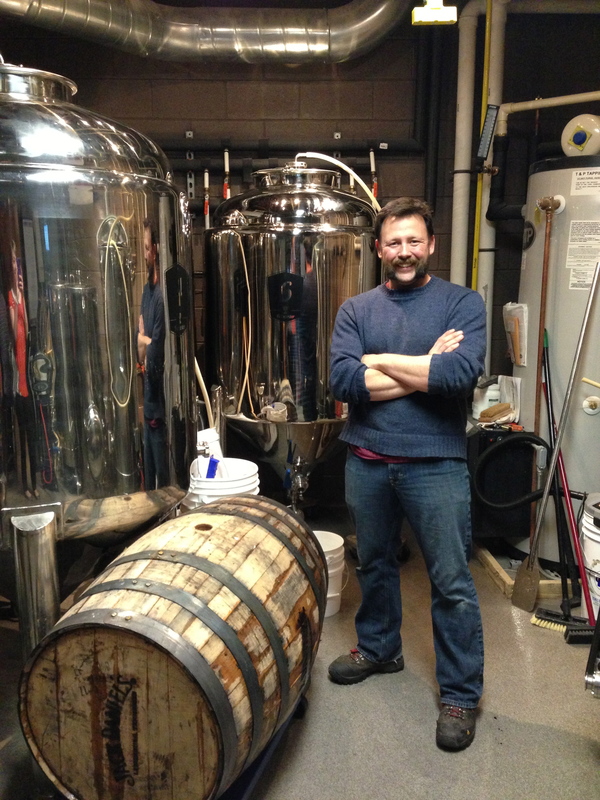 Les Stewart (pictured below) is the head brewer and along with Josh Wing, assistant brewer. Both men have a great passion for crafting unique beer. 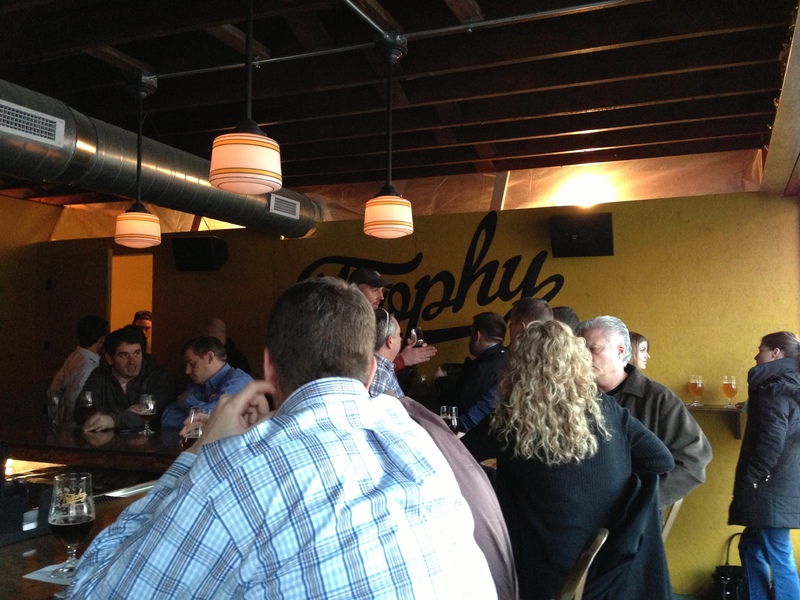 In mid-May 2013, Trophy Brewing Company will become a full service restaurant featuring brick oven pizza. An outdoor patio will also be added, just in time for the summer! 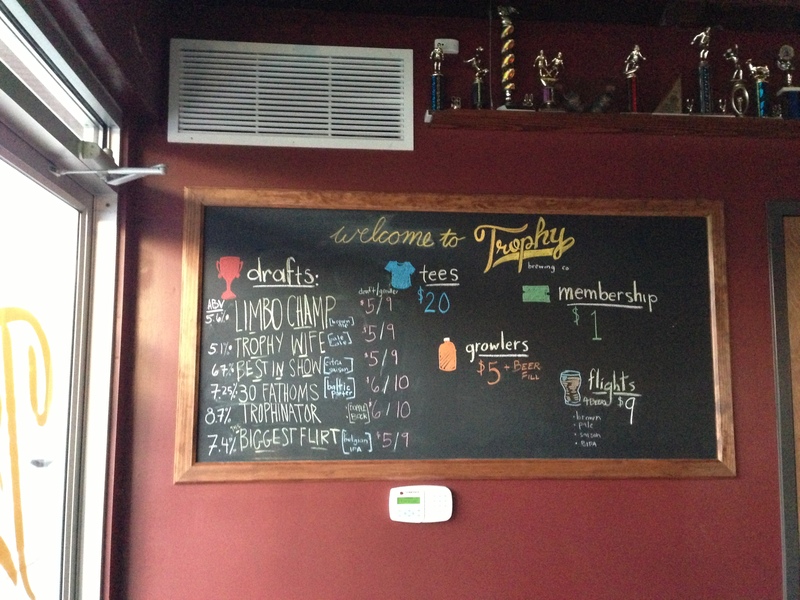 The cozy atmosphere and friendly bartenders at Trophy Brewing Company make you feel right at home. 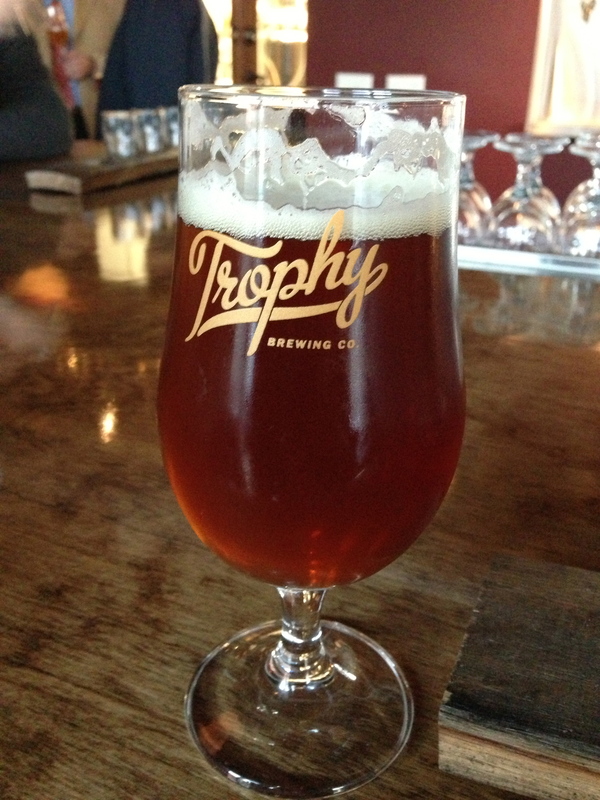 Trophy Brewing Company features beer that is often unique and always delicious. The brewers support the local community by partnering with other businesses in Raleigh. Trophy Brewing Company recently released a Slingshot Coffee Porter, brewed with Raleigh’s own Slingshot Coffee. Unfortunately, I didn’t get to sample this beer the night I went to the brewery because the Slingshot Coffee Porter was so popular. 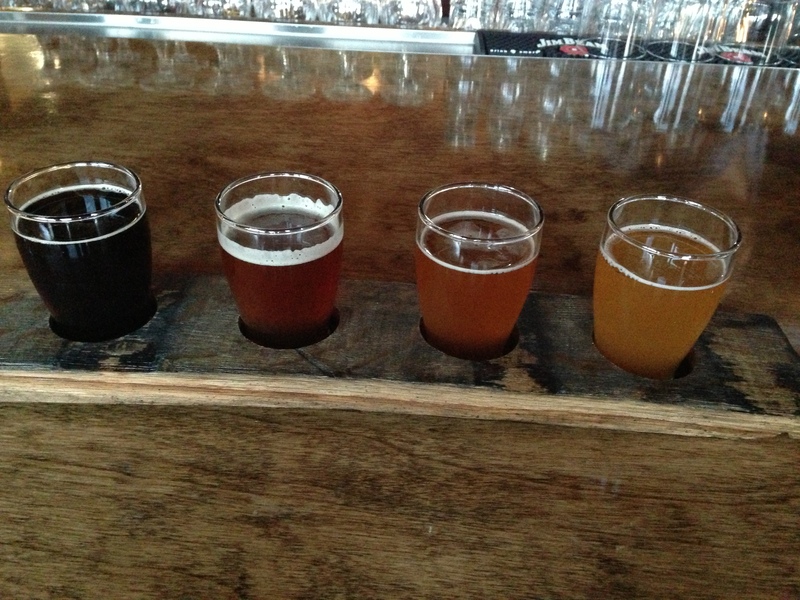 Of course, I couldn’t make up my mind so I ordered the flight of four beers. The flight, pictured below from left to right, featured the Limbo Champ brown ale, the Trophy Wife pale ale, the Best in Show summer saison and the Biggest Flirt Belgian IPA. Each beer was unique and I’m glad I selected the flight so I had the opportunity to try them all. One of my favorites was the Trophy Wife. Not only is the name hilarious, but the beer is delicious, light and has a clean finish. 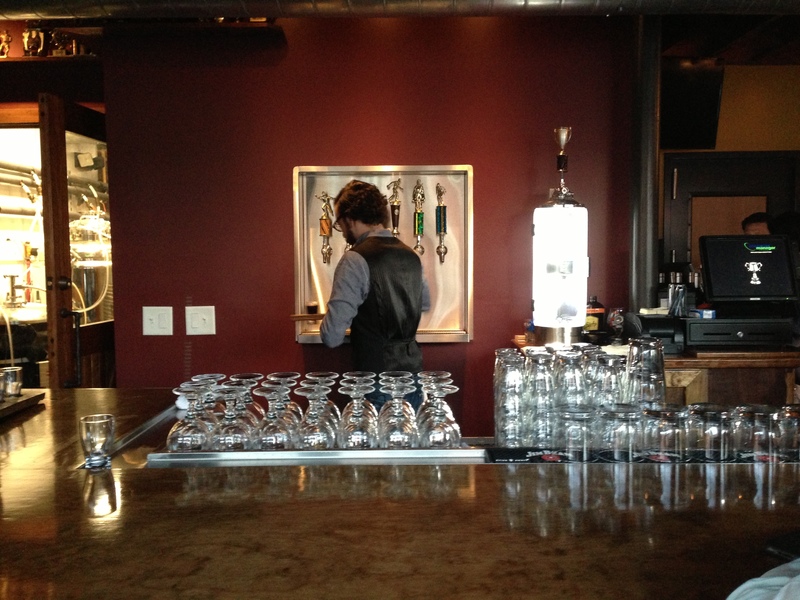 The brewery is decorated with trophies and even features a tap system adorned with trophies. Sean, my favorite bartender who also works at Busy Bee Cafe, told me that the trophies are from Raleigh residents who attended a special Trophy Brewing Company preview night. 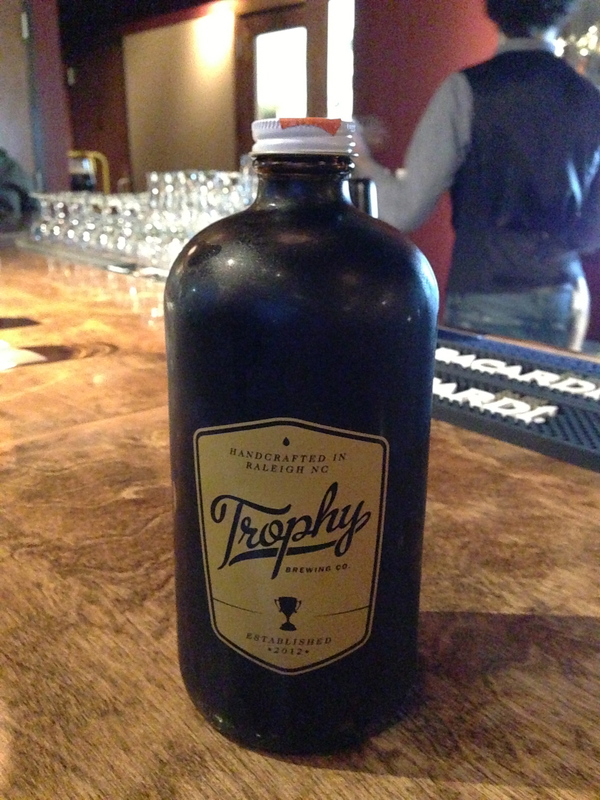 If you love Trophy Brewing Companies beer as much I do, you’ll definitely want to take home a growler. The growlers are 32 ounces, which either fit nicely in your hand or can fill two pint glasses. Trophy Brewing Company also counter pressure fills each growler right at the bar. Your beer is guaranteed to be fresh and will last much longer. I encourage you to visit Trophy Brewing Company. The beers are always changing and there’s a beer to please anyone’s taste buds.